President Trump arrives to speak at a signing ceremony for HR 2, the Agriculture Improvement Act of 2018, at the Executive Office Building on Thursday. Trump signaled earlier Thursday that he would not sign a temporary funding measure from Congress that doesn't include funding that could be used to pay for his trademark border wall, torpedoing the bill the Senate passed earlier this week without any wall funding that would have kept the government funded through early February. "I've made my position very clear — any measure to fund the government has to include border security. Not for political purposes but for our country, for the safety of our community," Trump reiterated ahead of a signing ceremony for the farm bill, adding that "a nation without borders is a nation not at all." Efforts to avoid a partial shutdown were thrown into chaos earlier in the day by the president. The House looked ready to pass the Senate's short-term spending bill, trying to avoid a messy fight just ahead of Christmas and as many lawmakers were eager to get home. But then House GOP leaders went to the White House and emerged saying that Trump had said he wouldn't sign the measure. 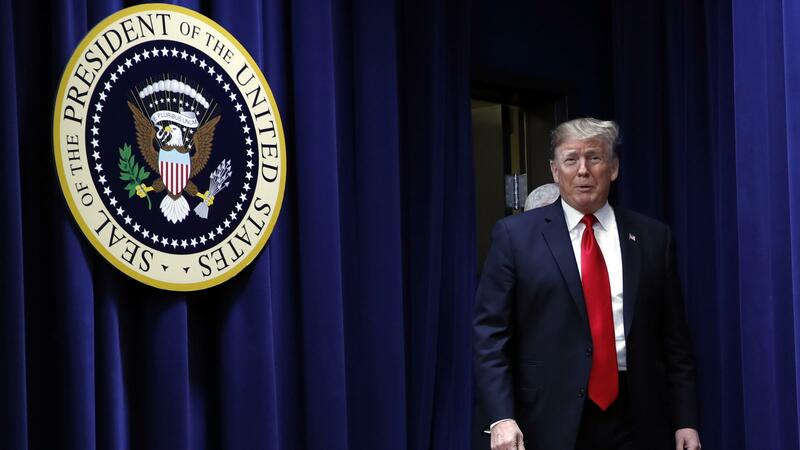 Now, Trump finds himself in a standoff with Congress over his signature campaign promise — which he repeatedly said throughout the presidential race that Mexico would pay for. House GOP leaders, in their last few days wielding the majority, acquiesced to the president and put the new measure, which included $5.7 billion to fund Trump's border wall and $7.8 billion for disaster relief, to a vote. Democratic congressional leaders had argued last week such a bill couldn't pass in the House, but it did by a vote of 217-185. Eight Republicans opposed the bill. However, the House bill is expected to be dead on arrival in the Senate, where Republicans have only a two-seat majority and any legislation needs 60 votes to move forward. Senate Majority Leader Mitch McConnell's office said the Senate would begin consideration of the House version on Friday, which would require consent for expedited consideration — something Democrats could block. Trump is scheduled to depart Friday for a 16-day vacation at his Mar-a-Lago resort in Florida, but a senior White House official said he will not go if there is a shutdown. 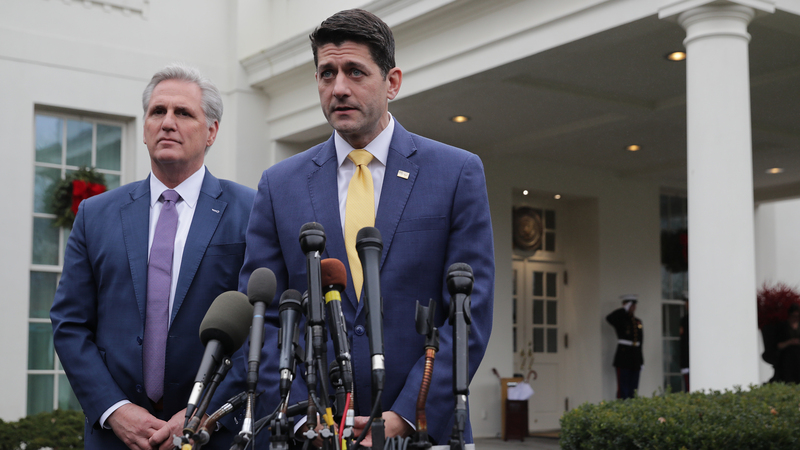 Speaker of the House Paul Ryan, R-Wis. (right), and House Majority Leader Kevin McCarthy, R-Calif., talk to journalists after meeting with President Trump at the White House on Thursday about a deal to fund the government. In his remarks prior to the House vote Thursday night, Trump had not specified a dollar figure he wanted and had suggested that the money could be used to build "steel slats" rather than a traditional wall to give lawmakers "a bit of an out." That distinction was not likely to sway any Democrats or moderate Republicans who oppose approving new money for any kind of physical barrier on the border. House Minority Leader Nancy Pelosi, D-Calif., likely to be the next House speaker, and Senate Minority Leader Chuck Schumer, D-N.Y., said GOP leaders told them Trump had pledged on Wednesday to support the continuing resolution to keep the government open, but they argued before the House vote that the president had been swayed instead by conservative pundits on Fox News and elsewhere to be obstinate instead. "President Trump is throwing a temper tantrum and creating a Trump shutdown of the government," said Schumer. "The president is doing everything he can to shut down the government," Pelosi added. In a tweet and a video posted online Thursday evening, the president said, "Border security must become a #1 priority!" and accused Democrats of putting politics before country. Republican leaders introduced legislation late Thursday afternoon that included roughly $5 billion in border wall funding and $8 billion in disaster aid. The decision to package it all together was a last-minute reversal from a plan outlined by Louisiana Rep. Steve Scalise, the No. 3 Republican leader. Scalise originally told Republicans that lawmakers would have a chance to vote on the border wall and disaster funding as a separate amendment. Instead of rejecting the package, the House sent a new bill to the Senate, where Democrats are certain to block it. "President Trump just met with Republican Members of the House. Not surprisingly, they all feel strongly about Border Security — stopping the flow of drugs, stopping human trafficking, and stopping terrorism. We protect nations all over the world, but Democrats are unwilling to protect our nation. We urgently need funding for border security and that includes a wall." Plans for a speedy vote on a short-term spending bill crumbled earlier Thursday ahead of Friday night's deadline as some House Republicans threatened to pull their support for any spending measure that did not include additional border security money. House GOP leaders struggled to persuade members to support a bill to extend current spending levels through Feb. 8. Many are concerned that Republicans will not have another chance to fulfill Trump's demand for $5 billion to build a wall on the border with Mexico. The Senate approved a spending measure Wednesday night that did not satisfy Trump on the issue of border security. Conservatives such as Rep. Mo Brooks, R-Ala., said voting on the short-term spending bill without border wall money amounts to a surrender on one of Trump's signature campaign promises. Brooks said he is confident that the House could uphold a veto — if a spending bill does pass and Trump refuses to sign it. But Brooks, like most Republicans, said they have no clear sign from Trump about what he is willing to support. "That is the $5 billion question," Brooks said. "I wish we had clarity on that; that would help us decide what to do." Trump tweeted Thursday morning that Democrats know "Steel Slats (Wall) are necessary for Border Security" and are "putting politics over Country" by refusing to fund the wall. He also threatened "not to sign any of their legislation, including infrastructure, unless it has perfect Border Security." In a tweet later in the morning, Trump said he was "promised the Wall and Border Security" by congressional leadership when he signed a spending package last year and that "it didn't happen!" Frustration with the spending bill extends beyond a core group of conservatives who typically oppose spending bills. Some reliable leadership allies, such as Rep. Steve Womack, R-Ark., also expressed concerns about the spending bill. "This is a different circumstance. We're about to lose the majority and we've made promises that haven't been kept," Womack said. "If we aren't willing to fight now on the way out of the majority, then when are we willing to fight?" Republican leaders had hoped to easily approve a spending measure to avoid a last-minute panic over spending. Funding for about a quarter of the government will run out at midnight on Friday, and the government will be forced to partially close unless a spending measure is agreed to. Support among House Republicans began to crack Wednesday night before the Senate vote even occurred. Members of the House Freedom Caucus, some of the most conservative members of Congress, railed against the wall-less spending plan in a string of speeches on the House floor. The group's chairman, North Carolina Republican Mark Meadows, urged Trump to veto the spending measure, saying, "We're going to back you up. If you veto this bill, we'll be there." The frustration grew Thursday morning during a closed-door meeting of House Republicans. Members emerged confused about the plan for the spending bill, telling reporters that the entire plan for a vote expected later in the day was up in the air. Ryan stepped out of a closed-door meeting of GOP House members to take a phone call from the president. As that call stretched on, leadership members decided to cancel a regularly scheduled press briefing ahead of the White House meeting. The spending measure, also known as a continuing resolution, would fund nine Cabinet-level departments and several independent agencies through Feb. 8, when Congress would again be forced to confront the issue. But Democrats, who will control the House in the next Congress, have adamantly refused to provide money for a wall. In a speech Wednesday, McConnell said he was "sorry that my Democratic colleagues couldn't put the partisanship aside and show the same good-faith flexibility that the president has shown in order to provide the resources our nation needs to secure the integrity of our borders as well as the safety of American families." A presidential veto or the failure of the House and the Senate to pass the same bill would mean that hundreds of thousands of federal employees including Border Patrol, FBI and DEA agents and TSA officers would continue to work over the Christmas holiday but without pay, while hundreds of thousands of other federal workers would be furloughed. But Trump was optimistic late Thursday. "Thank you to our GREAT Republican Members of Congress for your VOTE to fund Border Security and the Wall," the president tweeted, adding "So proud of you all. Now on to the Senate!" In a second tweet, Trump sought to put pressure on Democrats including Pelosi. "Soon to be Speaker Nancy Pelosi said, last week live from the Oval Office, that the Republicans didn't have the votes for Border Security. ... Nancy does not have to apologize. All I want is GREAT BORDER SECURITY!"